LINEBACKER® HD | Shelving, Inc. Protect valuable electrical cables, cords and hose lines from damage and abuse while ensuring a method of safe passage for vehicles and pedestrian traffic. Ideal for convention centers, amusement parks, construction sites, public utilities, municipalities, manufacturing plants and industrial applications. All weather polyurethane construction with heavy load capacity. Non-metallic protectors insulate cables/hose lines from human contact. Satisfies state and federal regulatory agencies. Multiple channels and sizes for various cable/hose line diameters. Hinged lid makes placing and removing cable/hose lines easy. Modular interlocking design is lightweight and easy to transport, set-up, disassemble and store. FOB Shipping Point. Load capacities up to 20,150 lbs. per tire -- call for specific load capacities for each model. 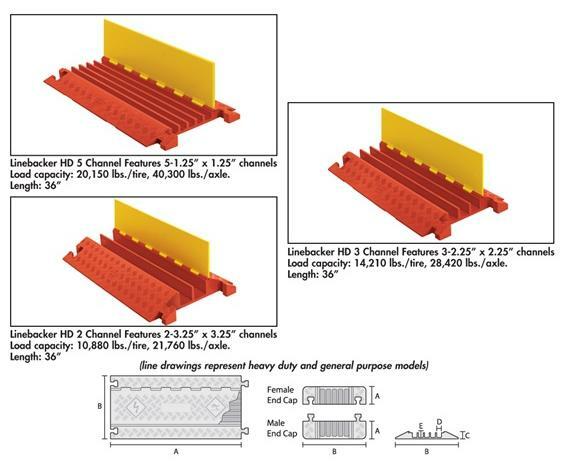 Features 5-1.25" x 1.25" channels. Load capacity: 20,150 lbs./tire, 40,300 lbs./axle. Features 3-2.25" x 2.25" channels. Load capacity: 14,210 lbs./tire, 28,420 lbs./axle. 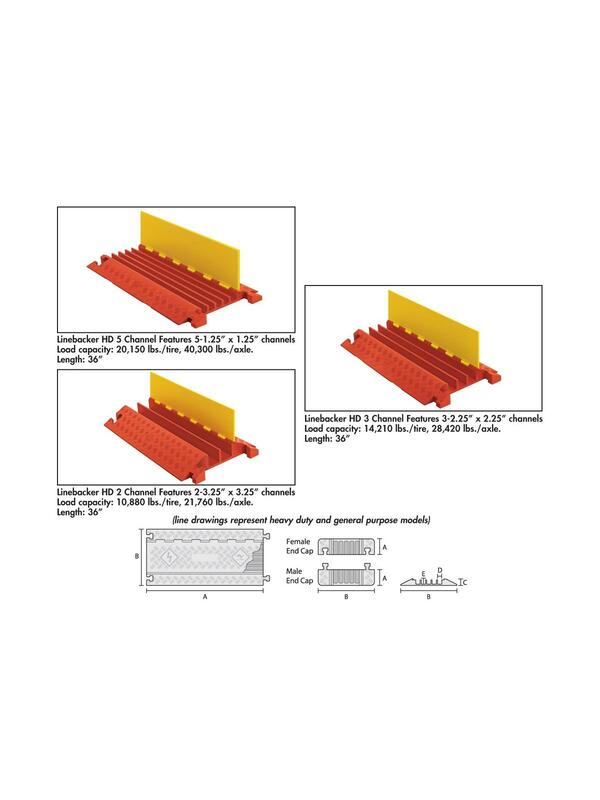 Features 2-3.25" x 3.25" channels. Load capacity: 10,880 lbs./tire, 21,760 lbs./axle. Line drawings represent heavy duty and general purpose models.